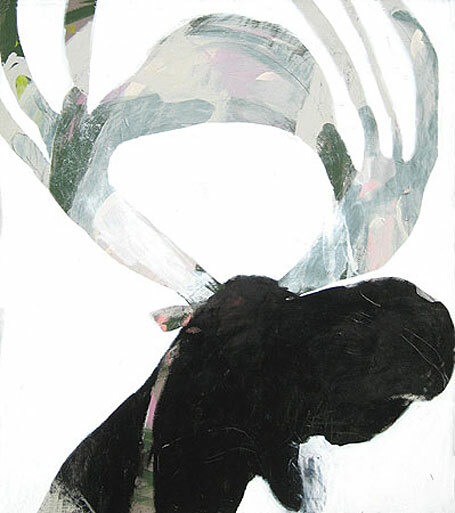 Elk by Karlee Rawkins - on display at the Big Rock Candy Mountain exhibition at Iain Dawson Gallery, Paddington, Sydney. Big Rock Candy Mountain seems to me the perfect title for the latest exhibition of works by Karlee Rawkins, which officially opens tonight (26.8.2010, from 6-8pm) at the Iain Dawson Gallery in Paddington (Sydney). The show is in fact named after a 1920s bluegrass song by Harry McClintock, "about a fantasy place with trees full of birds, streams of alcohol and chickens that lay soft boiled eggs" (Karlee Rawkins). 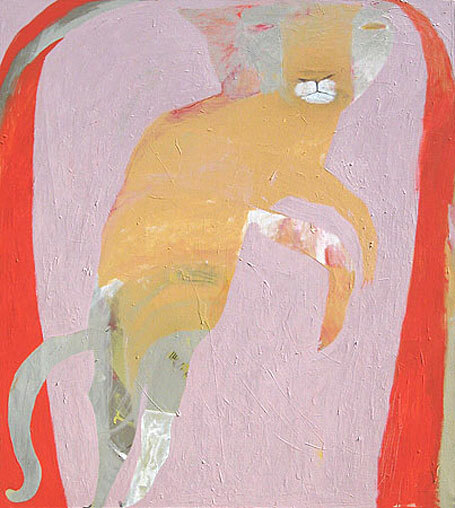 Puma by Karlee Rawkins - on display at the Big Rock Candy Mountain exhibition at Iain Dawson Gallery, Paddington, Sydney. Using high key colours in large blocks, thick brushstrokes and small areas of patterned detail, Karlee's works take on a bold, graphic quality. Since her April 2009 exhibition, Zoo Tomorrow, Karlee has developed an interest in traditional native American art and spiritual totems. 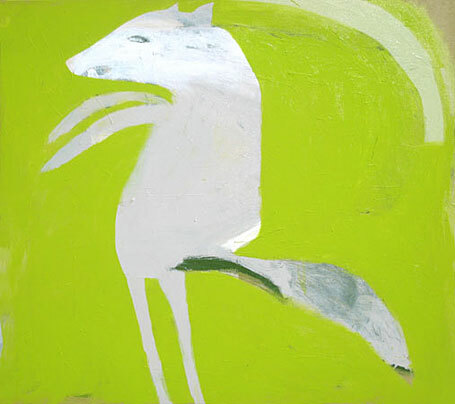 The animal subjects are isolated on the canvas and are "metaphors for emotions and experiences". 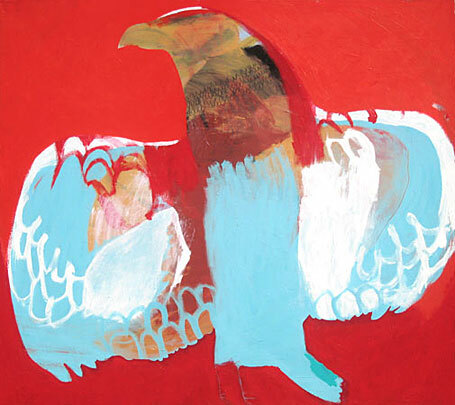 Spirit Bird by Karlee Rawkins - on display at the Big Rock Candy Mountain exhibition at Iain Dawson Gallery, Paddington, Sydney. Karlee's original paintings sell quickly, so if you're thinking of making a purchase, get along to the Iain Dawson Gallery post-haste! I hope to own one of her works one day... though this time I'm not sure if I could choose between Elk with its lovely textures (at top, sold) or Puma with its curious, vibrating colour palette (second from top, still available). Hope you love her works as much as I do! 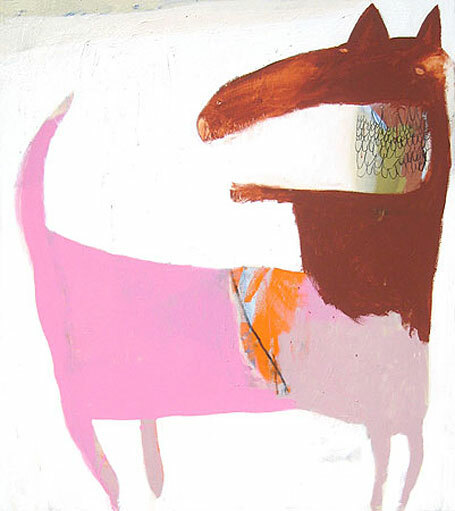 Pink Wolf by Karlee Rawkins - on display at the Big Rock Candy Mountain exhibition at Iain Dawson Gallery, Paddington, Sydney. 443 Oxford Street, Paddington, NSW 2021. To see more of Karlee Rawkins' artwork, visit her web site at www.karleerawkins.com or see our Zoo Tomorrow post from April 2009. Coyote by Karlee Rawkins - on display at the Big Rock Candy Mountain exhibition at Iain Dawson Gallery, Paddington, Sydney.